So far I've managed to put a 10,000 Bell down payment for my new house, which should be built by tomorrow morning. I was lucky enough to get two tricero skulls and sell one to the store for 5,500 Bells and donate the other to the museum. However, I'm still stuck with my lousy tent which doesn't have much floor space or appealing aesthetics. I've also gotten my citizen approval rating up to 41%, hoping that by tomorrow the shops will be restocked and the townsfolk will get my greeting letters that I sent them. 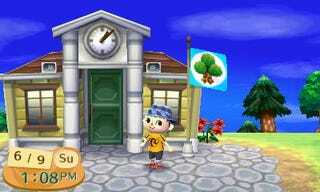 I really need to get the town development permit to make my town a city upon a hill. Aside from fishing a lot and shaking trees until I get stung by bees, I don't think there's much for me to do other than conversing with the townsfolk and learning all their quirky personalities. Since the slingshot and bug net are not yet available to me, I missed the chance to catch any bugs or shoot down passing balloons. As for townsfold, Puddles is by far my favorite with all her insane exaggerations and requests for me to find fruit and fish. So until tomorrow, I guess I will finish some homework and just take some time to relax on a nice sunday afternoon. And of course GoT season finale later tonight!